Club Penguin Cheats by Mimo777 Club Penguin Cheats by Mimo777: Club Penguin Tech Class Message From G! 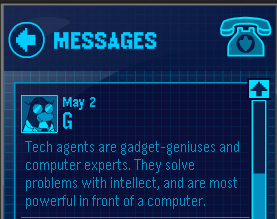 I'm not a tech agent... But my big bro is! There's a new Field-op Mimo! When you complete it, there is a message from Herbert, but it's written backwards. I translated it for you!